- A heavy-duty, aqueous-based, tank mounted machine with thermoplastic construction. - Flexible spigot and nylon flow-through brush. - Overall dimensions: 101.2cm L x 75cm W x 97.5cm H.
- 22.5cm depth soak basin (at deepest point). - 240 volt industrial grade pump. Refrigerators, Condenser coils and freezers. - Professional-strength, self-rinsing coil cleaner helps keep equipment at optimum performance level. - Designed for conventional and rotating parts washers that use a water-based degreaser. 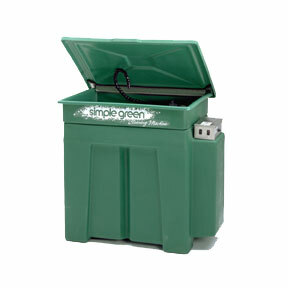 - Used liquid can be disposed of into oil/water separators that will reduce hazardous disposal costs. - Not classified as hazardous according to Model Work Health & Safety Regulations and GHS Criteria. - Makes 8 Litres! 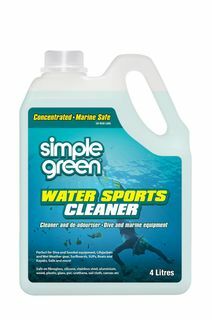 Fast removal of water spots, soap scum, scale and mineral deposits. - Safe on stainless, glass, chrome, tiles, ceramics, showers, baths, floors, walls, taps and pipes. 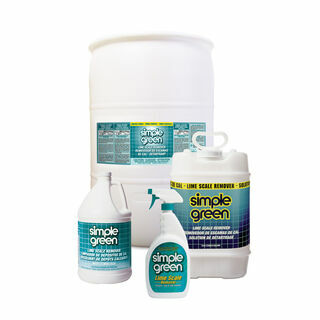 Crystal Simple Green is formulated for critical cleaning applications that demand a fragrance-free solution. It is a highly effective, concentrated, all-purpose degreaser and cleaner. Because Crystal Simple Green is fragrance-free, color-free and has high rinsibility, it is an ideal and effective degreaser/cleaner for use in many industries. including metal, concrete, rubber, synthetic and plastic. - No added colour or fragrance. - An NSF Certified product for use as a general cleaner on all surfaces in and around food processing areas – Categories A1, A2, A4, A8, B1, C1. Health & Safety Regulations and GHS Criteria. - Non-toxic, biodegradable, non-corrosive, non-flammable, non-abrasive. - Cuts through tough greases, oils, built-up grime and residue on aircraft, equipment, engines, machinery, wind turbines and more. - Meets a variety of aircraft testing specification including the BOEING SPEC D6-17487P. - Use on structual metals, hoses, seals & factory finishes without risk of hydrogen embrittlement or corrosion. - Concentrated, superior grease cutting & clean rinsing formula (dilution and application chart available). - Biodegradable and petroleum-distillate-free, no reagents that oxidize finishes or degrade plastics. - Makes 20 Litres! Professional strength formulation. - Streak-Free cleaning. Non-toxic, septic tank safe. 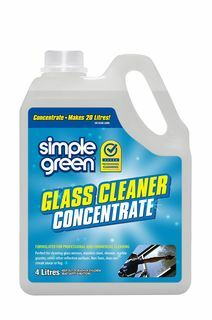 - Cleans glass, shelving, chrome, porcelain, PC screens and ceramics. - Makes 40 Litres! Formulated for professional and commercial cleaning. - Non-Hazardous - Biodegradable. Safe on metals, plastics and rubbers. - Eliminates problems of Oxidation and rust. - Free-rinsing / Low foaming formula. - Concentrated formula powerful enough for intense grime, yet gentle enough for continued maintenance of high-traffic areas. - Clean, degrease and deodorise all washable/ water-safe surfaces in a wide range of industries including mining, manufacturing and automotive. - Cuts through tough grease, oils, cutting fluids, built-up grime and residue. - No special PPE requirements for handling. scrubbers, pressure washers and foamers. - Dilution and application chart available. 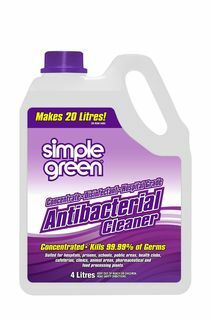 - Safely remove tough, built-up mineral deposits, hard water stains, soap scum and oxidation from a variety of surfaces including porcelain, ceramic tile, glass, aluminium, stainless steel, chrome & more. - Safe for drains and pipes including ABS, PVC, copper, and others. - No bleach, ammonia or phosphorous. - Organic salt formula won’t strip protective finishes, cause damage or discoloration, or etch sensitive surfaces. - VOC compliant, non-fuming, non-flammable. - Descales equipment including HVAC components, pipes, hoses, tanks, storage systems, spray rack systems, washing machines and more. - A 2x concentrated strength liquid with a sunshine fresh fragrance. Septic Tank safe. - For both top and front load washing machines. - Tough on dirt, grease, grass, food, coffee and wine. 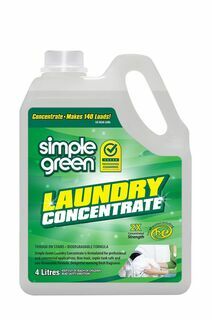 - One bottle washes up to 100 High Efficiency (HE) loads or 66 Standard loads. HVACR coils and cooling towers. manufactured parts and extruded tubing. - Use in aqueous-based parts washers, steam cleaners, floor scrubbers, pressure sprayers and ultrasonic baths. - Formulated for professional and commercial cleaning. - Minimizes re-depositing of fingerprints, restore luster & sheen to all metal surfaces. 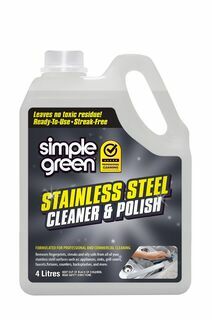 - Dual action metal cleaner & Polish in one, leaves no toxic residue. - Perfect for Dive and Snorkel equipment, Lifejackets and Wet Weather Gear, Surfboards, SUPs, Boats and Kayaks, Sails and more. - Non Toxic Formula, Biodegradable.